Training Treasures: Boo Boo Blends- Ouch! Like this idea? Find this bear for free in my TpT store HERE! Want the whole set? 27 pages (that took a long time to make!) HERE! This was a fun way to get my picky 2-year old to work on his blends. First, I found this cute Band-Aid Letter Matching game on Pinterest. But seeing as I'm not teaching letters to anyone, I didn't need this exact version. Still, it was a cute game I tucked away on my Pinterest board that stuck in my mind. Then when I found these free textured bears on Teacher's Pay Teachers, I knew exactly what I was going to do! The bears were cute, but needed a little tweaking for my activity. After freeing up some room on the bear's forehead, I printed the white bear, colored it blue to match my son's favorite teddy, and laminated it. I found some random bandage clipart online (that is used with permission), and printed and laminated them. 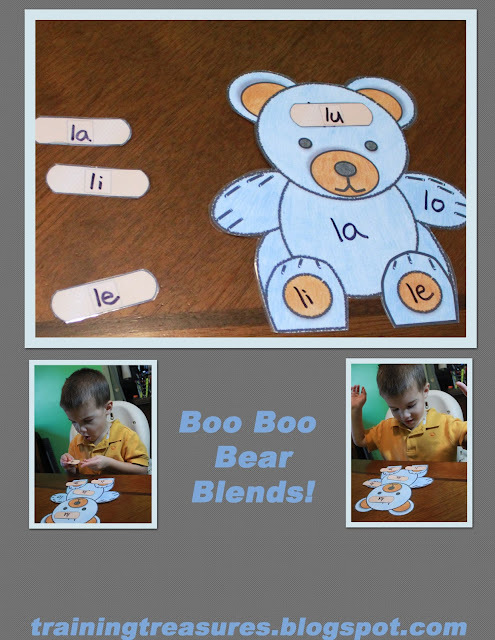 Afterwards, I wrote la, le, li, lo, and lu blends on the bear- a blend ladder that my son is having a little trouble with. I told him the bear fell off his bike and got a few boo boo's. The bear needed some help, and my son was happy (although quite serious) to help! After he read each blend and matched the bandages to the boo boos, I told my son that the bear was all better and the bandages needed to come off. I told him which boo boo (blend) was all better, and my son took the corresponding blend off the bear, reading it as he gave it back to me. Because the activity went so fast, and because of the little bit of dramatic play- my son happily played along twice, and has since asked to play it again! This game is a winner in my book! And what I like about it is that we can switch up the animal to keep it interesting. But next time, I'm printing on colored paper. I don't have time for all that coloring!